Tired of looking at the same old floorboards? Or perhaps you're not fond of waking up and shuffling your cold feet toward the dresser in search of socks every morning. The solution to your problems? An area rug. Designers swear by its ability to tie a room together, and looking at these 10 standout spaces, it's easy to see why. If you pick the right color and pattern, a rug can upgrade a bedroom from blah to swoon-worthy. Choose a neutral shade for a romantic, vintage effect, or opt for a jaw-dropping, multicolored Persian rug to pull your room together. And if you have a tight budget, don't be afraid to scale down. Ready to outfit your own space? These stunning bedroom rug ideas promise to spark your inspiration and make the selection process a little easier. White walls and bold patterns can fall flat in a space without texture. However, the right bedroom rug idea can add dimension and drama — even if the pattern is simple. 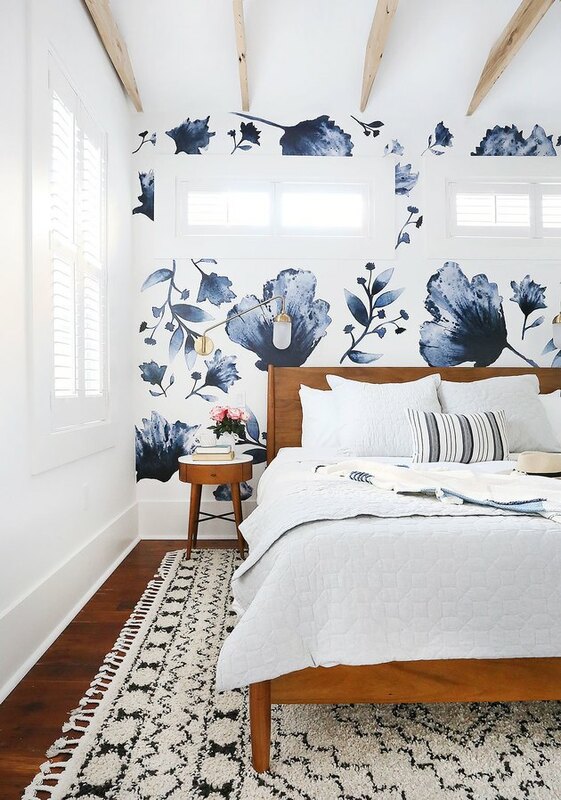 Erin from the blog Sunny Circle Studio used this inexpensive Amazon rug (starting at $85) to add a little extra oomph to a room featuring an oversize floral-pattern accent wall. Nothing is worse than waking up, stretching your arms — and stepping onto cold hardwood floors. Start your mornings off right and save your feet the shock with a cozy area rug like a high-pile option in a calming color hue. It looks like Sarah from Thrifty Decor Chick already has one furry little friend who approves. 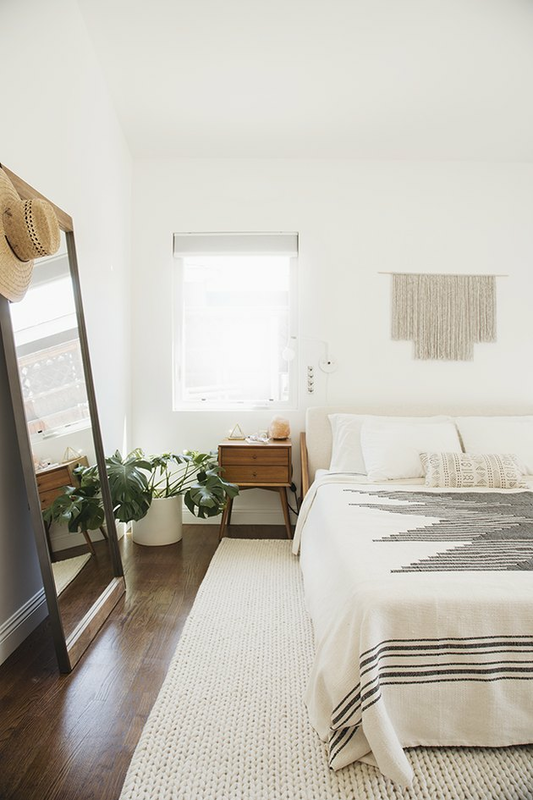 All-white neutral bedrooms aren't going out of style anytime soon — but when paired with dark wood flooring, the effect can be jarring. Follow the lead of Molly from Almost Makes Perfect and use a matching rug like this one (starting at $77.39) to define a border around your bed. 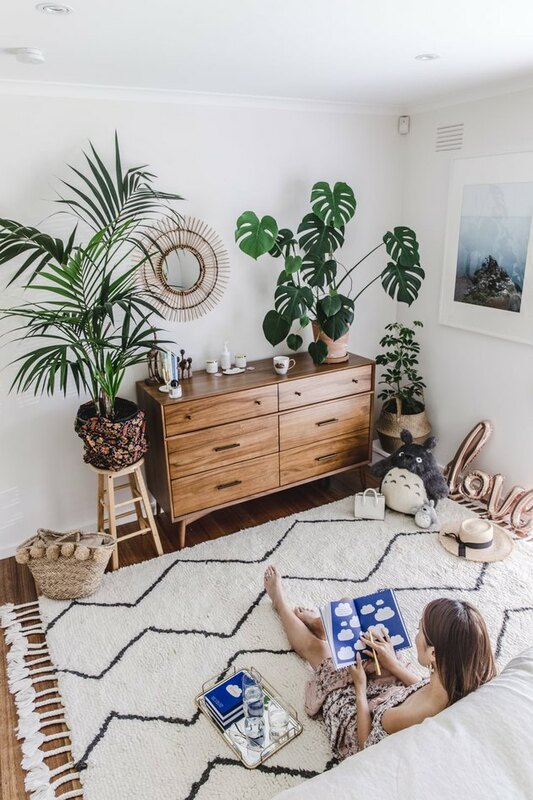 Style the walls with mirrors, dressers, and monstera plants. Landing on the right bedroom rug idea can dramatically increase the cool factor of your space. 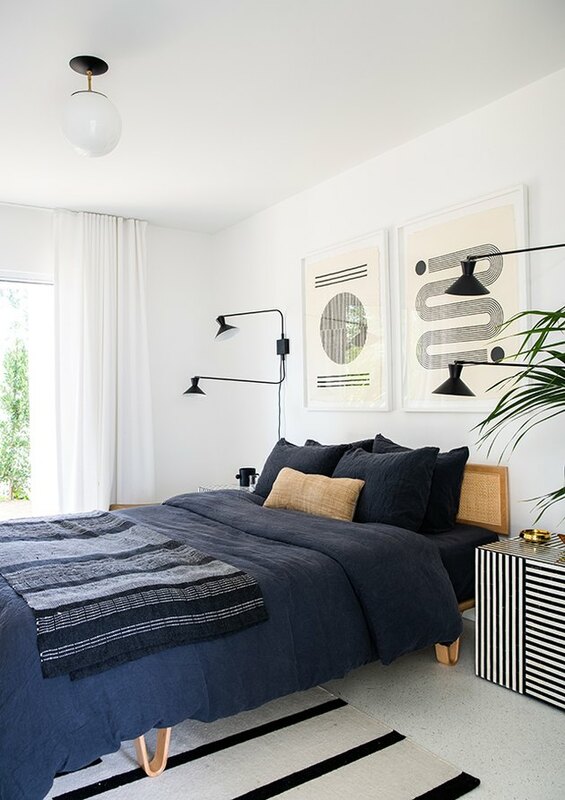 For instance, this chic respite designed by Sarah Sherman Samuel features an option with a contrasting stripe pattern (starting at $195) to complement the bold, graphic patterns throughout the room. Wood furniture is far more than, well, furniture. The different wood grain and finish of each piece adds another layer of warmth and character to your room. 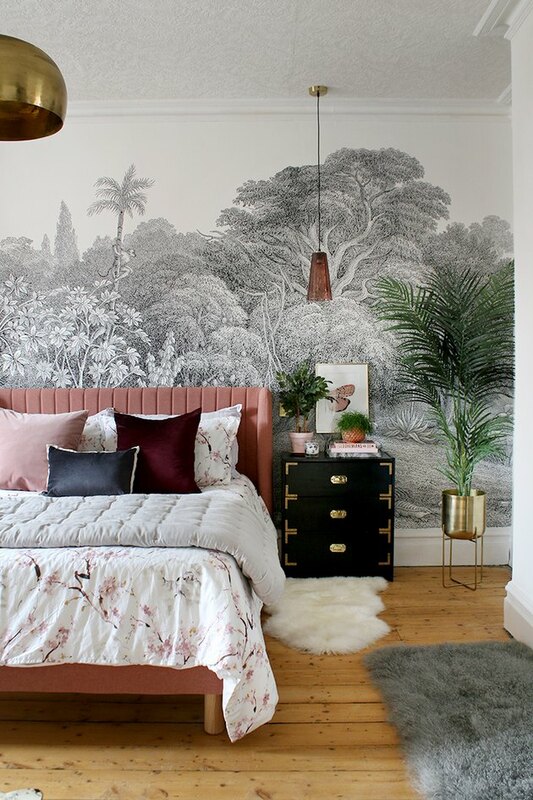 So highlight this natural beauty by selecting a rug that enhances those details, like Cristina from Flowers and Folk did in her bedroom with this rosy-hued number. Here's another bedroom rug idea: Use it to define different parts of your sleeping quarters. 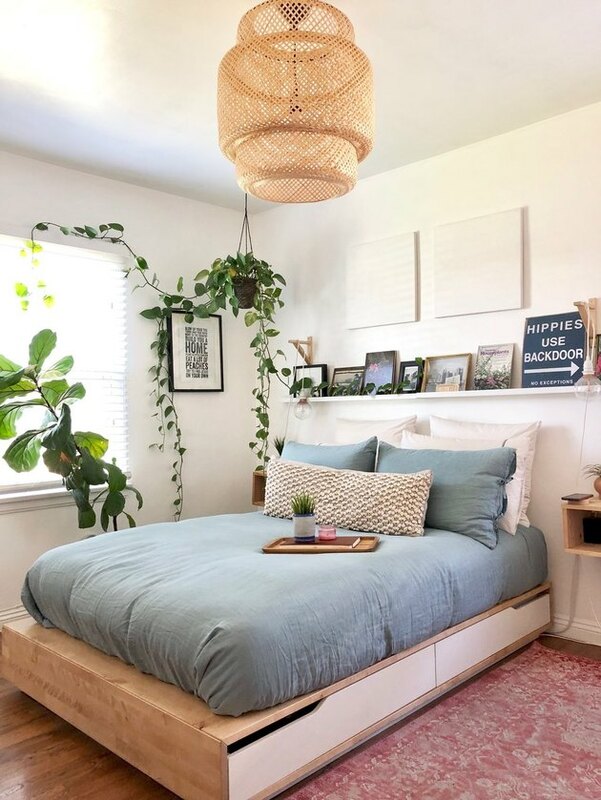 Blogger Connie from Connie and Luna used hers — which she snagged from West Elm (starting at $299) — to create a relaxing spot for reading at the foot of her bed. Sprawl out on the soft surface with your favorite book — and if you get sleepy, just pull the covers down. 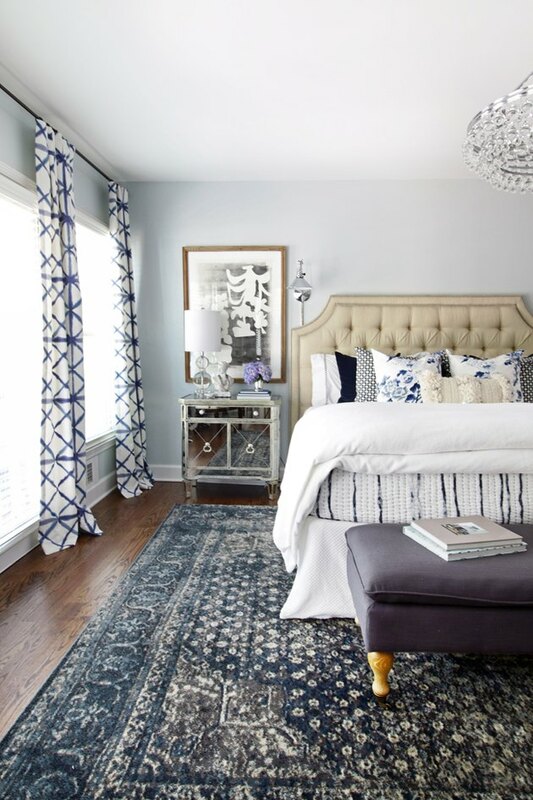 Once you've decided on the accent color for your bedroom, go all-in by choosing an area rug in the same shade. The result? A curated space that's not afraid to take risks, like this room designed by Kristin from the Hunted Interior. Nothing feels more sophisticated than a colorful Persian rug. Combined with a wooden bed frame, a rustic blanket ladder, and a yarn wall hanging Victoria from Southern Trunk managed to create a rustic space with cabin vibes that's worthy of a swoon. Natalie from My Vinatage Porch opted for a neutral rug with a barely there pattern, and paired that with a luxurious crystal chandelier and an upholstered headboard. Combined, they create an elegant space worthy of a chalet in the French countryside. 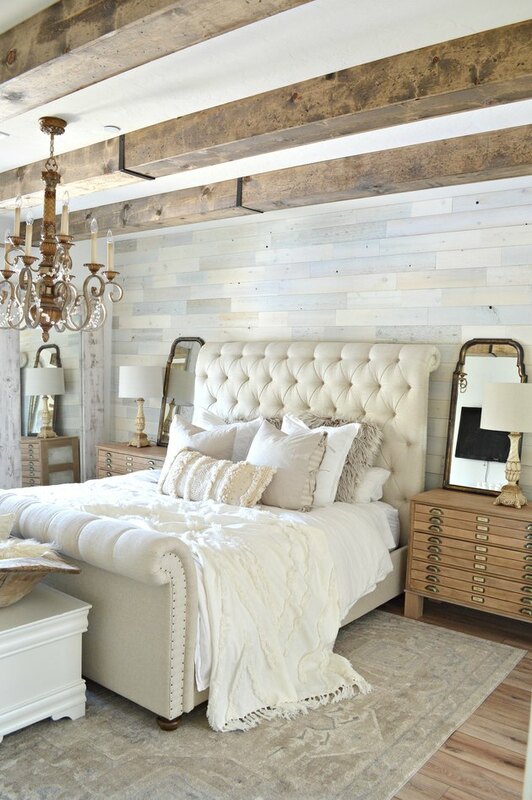 Finish the look with antique mirrors and vintage nightstands. Yes, an oversize rug sure feels lush — but you can get the same effect for much less money by using several smaller rugs. 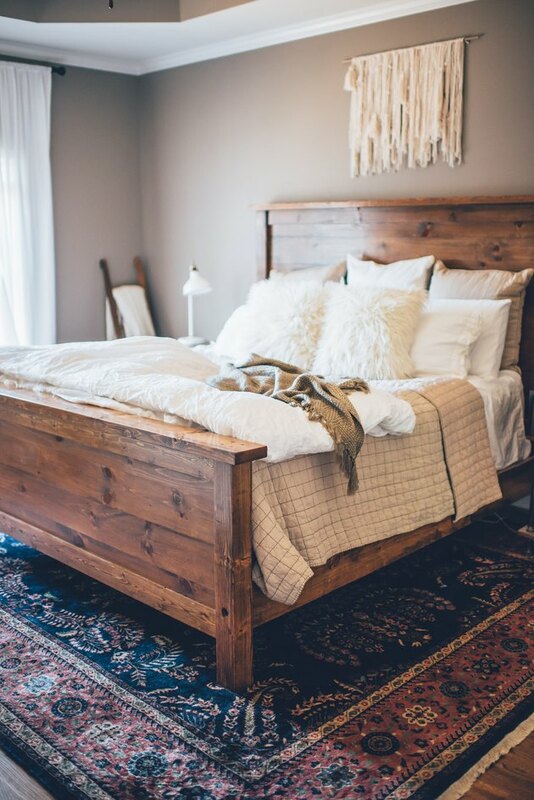 Take notes from Kimberly over at Swoonworthy, and place soft sheepskin rugs wherever you stand the most — like on each side of the bed and in front of your nightstand. Now you can enjoy a cozy, glamorous bedroom at a fraction of the price.